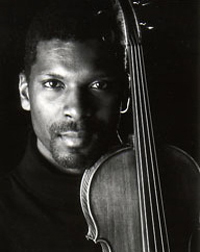 Amadi Azikiwe, violist and conductor, has been heard in recital in major cities throughout the United States, such as New York, Boston, Cleveland, Chicago, San Francisco, Pittsburgh, Houston, Baltimore, and Washington, D.C., including an appearance at the U.S. Supreme Court. Mr. Azikiwe has also been a guest of the Chamber Music Society of Lincoln Center at the Alice Tully Hall in New York, and at the Kennedy Center in Washington D.C. He has appeared in recital at the Piccolo Spoleto Festival in Charleston, on the “Discovery” recital series in La Jolla, at the International Viola Congress, and at the American Academy of Arts and Sciences. Since then, he has performed throughout Israel, Canada, South America, Central America, India, Japan, Hong Kong, and throughout the Caribbean. As a chamber musician, Mr. Azikiwe has appeared in concert with the Chicago Chamber Musicians, the Chester, Miro, St. Lawrence, Anderson, Arianna, Harrington and Corigliano quartets. He was also a member of the Concertante Chamber Players, and is a former member of the Ritz Chamber Players. Among Mr. Azikiwe’s prizes and awards are those from Concert Artists Guild, the North Carolina Symphony, the National Society of Arts and Letters, and the Epstein Young Artists Award from the Boys and Girls Clubs of America, with whom he still maintains a strong artistic and mentoring association. Mr. Azikiwe was previously the conductor of the Old Dominion University Chamber Orchestra and the Atlanta University Center Orchestra. He was also a visiting faculty member of Indiana University’s Jacobs School of Music in Bloomington, IN. Currently, he is on the faculty of James Madison University, and Music Director of the Harlem Symphony Orchestra. He has guest conducted for the Intercollegiate Music Association, at the Gateways Music Festival, and the Trinity Opera Company. Mr. Azikiwe has appeared as artist faculty at the Brevard Music Center, Apple Hill Center for Chamber Music, Killington Music Festival, Mammoth Lakes Chamber Music Festival, Yachats Music Festival, and the Aria International Academy in London, Ontario.